October has passed, so we must say farewell to Cyber Security month, but not before we leave you with seven important things to remember, thanks to Chris Moschella, Manager of Risk Advisory Services at Keiter, who was on hand at a recent Knowledge Network lunch. Listed below are just a few of the things we learned. Attacks can cost hundreds of dollars per data record to recover, but it’s the damage to your reputation and loss of business (and sometimes employees) that costs SMBs the most. One of the best investments you can make as an SMB owner is in security awareness training. 91 percent of breaches start through email. It’s vital to know where your “cyber doors and windows” are – and to keep them closed. Mobile devices, laptops and phones = examples of cyber windows. Know exactly where your sensitive data resides – and limit who has access to it. When it comes to security, know where your data/internet service provider’s responsibility ends and yours begins. 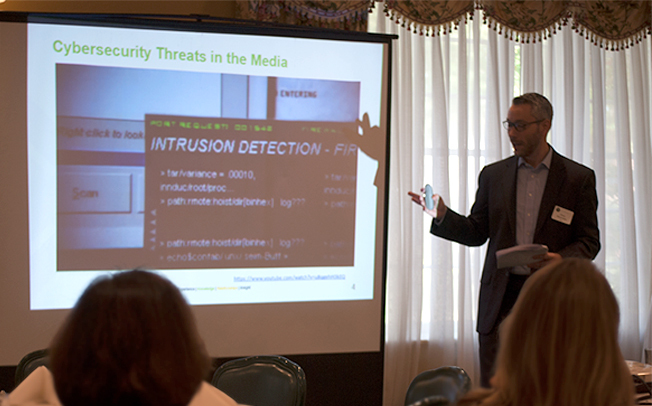 Members Only: Please send me Chris Moschella’s presentation on cyber security risk prevention. “If something is not important to you, there is almost a zero percent chance it will be important to your staff.” – Chris Moschella, Keiter, on setting a serious corporate tone when it comes to cyber security and threat prevention.